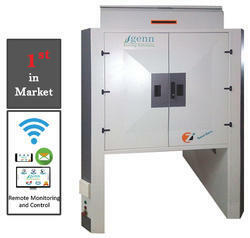 GENN is proud to introduce the COTTON SORTER, a real time system for the detection and removal of contaminants from raw cotton in the blow room line. All unwanted material that differs from the cotton throughput is detected by Ultra fast CCD cameras and removed by means of high speed air guns. 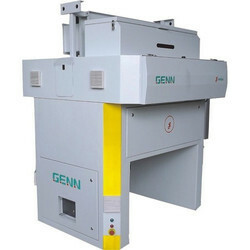 GENN COTTON SORTEX is the latest addition to GENN's textile electronic products with our state of art modular technology; customer is benefited with integrated, accurate and efficient product. Remarkable performance in the cotton cleaning process. GENN Imaging technology gives much better image spectroscopy under light source to identify all colored foreign fibers. Z+ detects Optically brightened polypropylene contaminants by using UV lights. High Frequency acoustic waves give more reflectance in Optically Non-brightened PP. Double sided cameras can gives excellent performance process. Camera can scan 7400 samples per second. 2. Lens: - High precision dedicated lens to receive images, which can distinguish the heteromatic regions of 0.088mm2 accurately. Manual IRIS and Focus lens easily controls incoming light to the camera. LED lamp: High performance LED optical system design ensures maintenance free, lower energy consumption, less heat and longer life. LED light provide uniform lighting throughout area and gives better life time greater than 50000 hours. Innovative smart LED shadow less cold light system design can efficiently find out small spots, light yellow and core white which make identification and judgment much easier, sorting more accurate. The light source has long service life, high luminous efficiency and strong anti-interference stability and no warm-up is needed. Ultraviolet Lamp: UV lamp is used to detect optically brightened and semi brightened contaminations. It includes White PP and White paper etc. High spectral purity of UV light source system, the serious characteristics of this system are stable performance. 5. Acoustic Sensor: - High frequency Ultrasonic sensor detects contamination denser than fibers stream. It includes transparent plastic films and white PP woven fabrics. High frequency scanning rate detects minimum size particles as well. 6. Ejectors: - Exclusive sorter solenoid valve with ultra low air consumption ensures optimized carryover ratio and high sorting accuracy. High speed precision serviceable ejector can remove 77 contaminations per second. 7. Human Machine Interface: - With intelligent operating platform, the system can be mastered and operated easily, turning the intelligent communication between human and machine into reality and eliminating all your concerns about operating. 7” TFT touch screen with 65535 colors gives enhanced machine safety and Easy debugging.